Bot Thoughts: Eagle: sudden clearance errors, isolation wrong? Eagle: sudden clearance errors, isolation wrong? 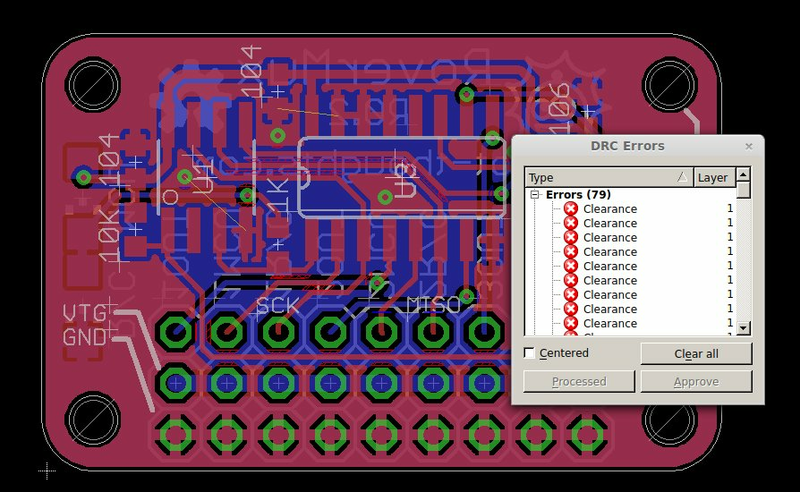 You open up an Eagle board file only to find clearance errors when you run design rule check (DRC). Clearances that were working yesterday, and for the past hundred days on numerous boards, in fact. Then you notice polygon isolation (clearance between polygon and trace) is too large. Pins that used to be connected to the polygon aren't. You can't manually reduce isolation. How do I fix this strange behavior? DRC errors? I swear this was working yesterday! The clearance value in the Edit > Net Classes dialog was set to 0.355mm (~13 mil) for some reason. Zeroing it fixed the DRC errors and isolation issues. The Net Classes clearance value overrides your DRU (Design Rule) file settings. 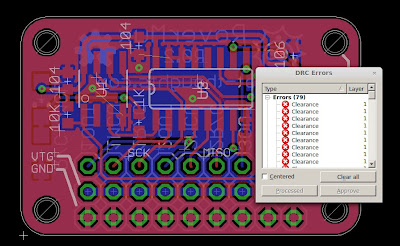 OSHPark's clearance is 6 or 8 mil and I rely heavily on these tolerances in my designs. So you can see how suddenly increasing to 13 mil would blow my design. Thank you so much, I've spent 1h trying to figure out what was causing those clearance errors! Thank you so much, I've spent almost 1 hour trying to figure this out! I spent days figuring this out...thanks for the solution!! !